A blog about running after finishing a 25 year career in the military. I go over local and regional races, life as a retired Army person, and occasionally review products that would help with running or work-outs. Black Friday came around and I put my name on a list for a special offer from Aftershokz. Aftershokz ran a special “BOGO,” meaning you Buy One set of Aftershokz Trekz Air or Aftershokz Trekz Titanium, you can Gift One set of Aftershokz Titanium for free. 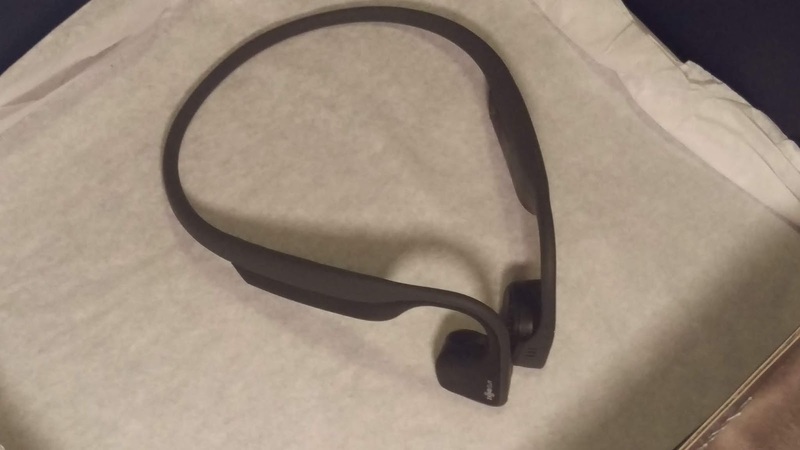 Aftershokz’s headphones are not the normal kind of listening device. They don’t go in the ear; instead, the headset wraps around the back of head and the speakers sit in front of your ears. They produce vibrations that travel through the cheekbones to the inner ears. This design allows for uninterrupted sound for your enjoyment WHILE you are still able to hear your surroundings. As I write this, I currently have music playing and the people sitting next to me cannot hear a thing coming from the headphones, while I on the other hand, can hear everything they say. I first experienced Aftershokz’s products when I attended the Cooper River Bridge Run Expo earlier this year. 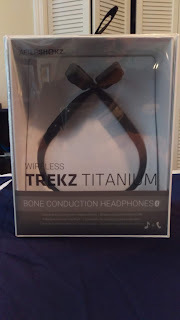 I found the bone conduction technology fascinating, but didn’t buy a pair then for two reasons: 1) I still run almost exclusively with my Microsoft Zune (if it’s not broke, don’t fix it) which is not Bluetooth compatible and 2) the Trekz Titanium retailed for 99.95 USD and the Aftershokz Air for 149.95 USD. As long as my Zune stayed as my primary form of running entertainment, I couldn’t justify paying for a set of headphones I would use occasionally, no matter how great the Titanium headphones were. Fast forward to Thanksgiving time, and I seriously contemplated getting a pair. My Zune has lasted almost a decade now and Microsoft stopped making that MP3 player several years ago. At some point, it will die on me, but I’m still amazed at its battery life and functionality. When I received an invitation from Aftershokz for their BOGO #GiveGoodVibes campaign, I signed up. 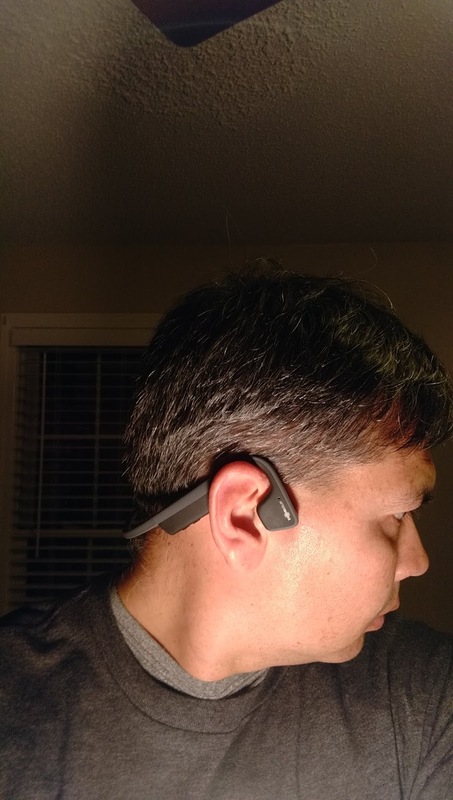 Aftershokz set the initial limit to the first 2,000 orders, and just because I registered for the event did not mean I had to commit to the deal. Well, during Black Friday, or rather Thursday evening before Black Friday, we casually went shopping and the window opened for the BOGO offer. 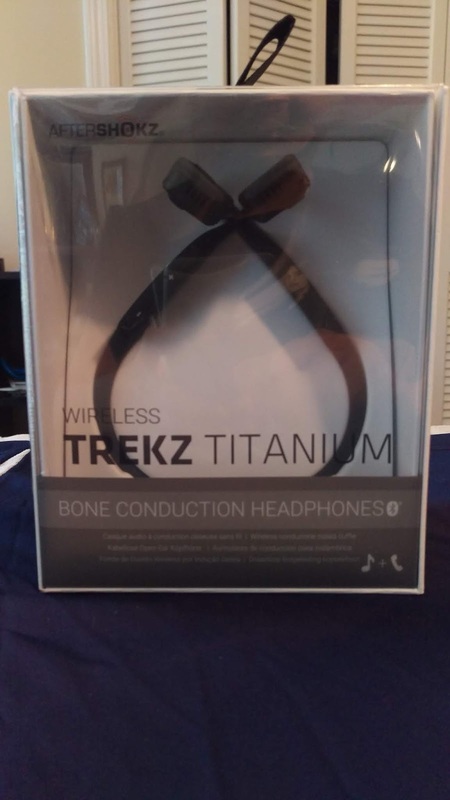 I thought and thought, and after an hour, I looked at their website and saw that not only did the BOGO offer was live, but Aftershokz ran a discount on the Trekz Titanium and the Trekz Air. The Aftershokz Titanium went from 99.95 to 79.95 USD and the Air went from 149.95 to 119.95 USD. With a discount AND the BOGO offer looming over my screen, it didn’t take much to place my order. Aftershokz later extended the deal for additional 2,000 sets on Friday. Less than two weeks later, I received my order in the mail. 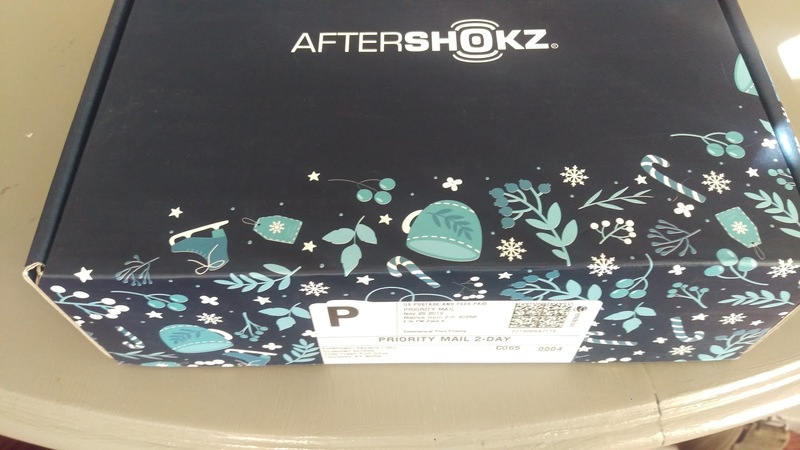 A nice blue, decorated box with the Aftershokz logo and priority mail postage sat at my front door. I opened it and there sat two pairs of Aftershokz Titanium: one in a normal box and the other in a gift bag marked with the #GiveGoodVibes tag. As much as I wanted to rip into the box, that particular set was reserved for someone else in my life, and I had no problem with taking the gift bag set. The gift bag held the Titanium headset, a pair of earplugs, a USB charging cable, spacers for the headphones in case someone has a smaller head, the warranty card, a quick start guide, and a multi-language maintenance and support sheet. 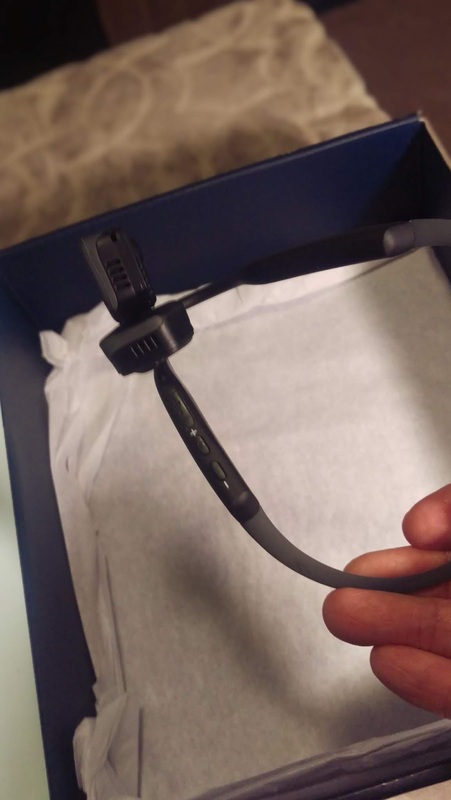 Aftershokz sends out its headphones with half a charge, but I wanted to charge mine all the way before I played with it. The Titanium has a multi-function button on the left side of the headphones and two volume control buttons along with the charging port on the bottom of the right side. To turn on the Trekz Titanium, you hold down the volume up, or “+,” button. Seems pretty simple. I also keep finding out my Titanium’s battery when I press the “+” button as well. 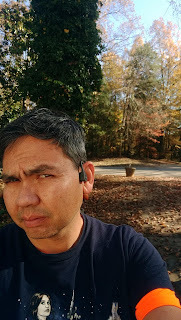 I’ve tested the Aftershokz in several different environments: leaf blowing, a phone call, music from my laptop, a game on my cell phone, and general wearing. While I worked on my backyard with noisy equipment, I could easily hear my playlist with no distortion from the leaf blower. As for the phone call, I honestly did not know the Titanium worked as a speaker and listening device; I thought I purchased just a listening set. I tapped a button on the headphones and amazingly, the call picked up. This also threw my brother off as well, since as much as I love technology and trends, I am slow to actually buy things for myself like that. After doing yard work, I went inside, synched the Titanium with my laptop and listened to music while I worked on some other things on my laptop and later around the house. The bass on the Titanium is even better than I remembered from the running expo earlier this year. And when I paired the headphones back to my cell phone to play a game, I heard subtle sounds the game programmers put in the game; sounds I couldn’t pick out on my phone’s own speakers. I will say that you shouldn’t set the audio volume to full on the Titanium when playing music. 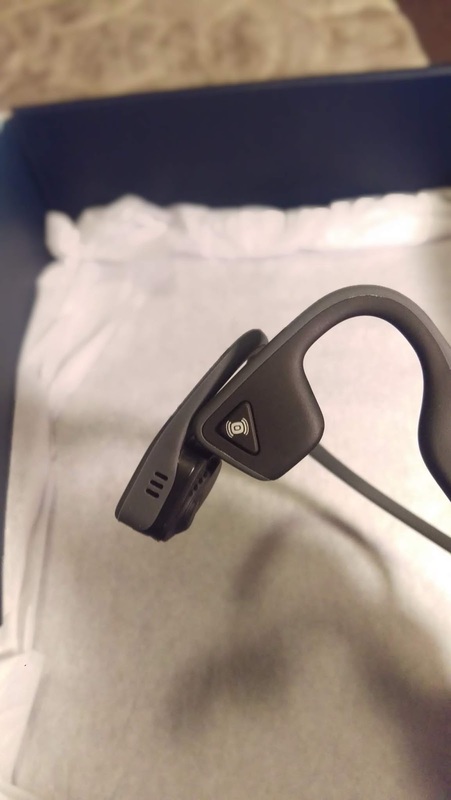 I listened to a particular Krewella song with some good bass that vibrated a lot on my cheeks due to the Aftershokz’s bone conduction method. It felt very weird before I finally turned the volume down. It’s really amazing how I could listen to my music and hear my surroundings every time I used the headset. They stayed firmly on my head with no bobbing or bouncing around. I presume the spacers will do the same for people with smaller heads, if they are properly placed on the headset. These headphones are great for hearing whatever I want to listen to while also letting me stay aware of my surroundings because I can hear noises that would otherwise be drowned out by normal headphones. 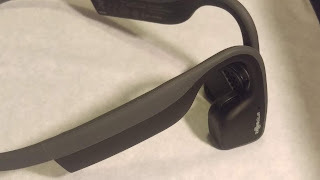 If you are on the fence about getting a set of Aftershokz’s headphones, any of them, I suggest checking out a store that sells them because quite a few have a demo pair nearby. Also, Aftershokz does run the occasional sale and discount. Amazon sells Aftershokz products and if you have a gift card this Christmas, birthday, or any other occasion, they would make a good choice. After a 25 year career in the military, one of the few things that will continue with me will be my love to run. I'm not as fast as I used to be, but that doesn't stop me from being around a crowd of like-minded people.